Over the past five days, we've counted down the companies we consider to be the best in the mobile gaming industry. Of course, all such lists are - to a degree - subjective. If we only had the information, we could generate a top 50 in terms of total downloads, daily or mobile active users, or sales and profitability. Yet the comparative ease of such information - even if it were ever available - would make such a list lifeless and generic. The strength of PocketGamer.biz's annual top 50 is the combination of hard and soft information, albeit it from a geographically and culturally North Atlantic view point. 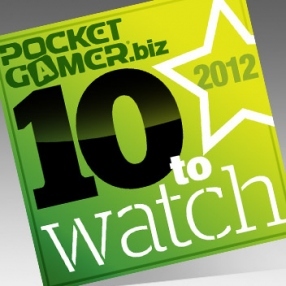 In this context, the following list of 10 mobile developers to watch isn't so tightly compiled. My thinking is that as the industry matures, the top 50 list will become less dynamic - there will be less opportunity to release a surprise hit, to come from nowhere and generate $10 million in sales, do an Angry Birds or a Tiny Wings. And that's where our 10 To Watch list comes into play. It's a personal view of companies I've closely followed in the mobile gaming space - ones I think have the potential to make it big this year. It's not meant to be exhaustive and it's not a comparative rank - merely alphabetic. Also, there are plenty more companies who could fit into this definition. To that extent, this is a subset, while the point of the top 50 is that it's the set. Similarly, 10 To Watch is a list that's going to change year-on-year. My hope is some in this year's list will make it onto the definitive top 50 in 2013. US outfit Appy has been around almost as long as the App Store. Spun out by veterans of the console scene, it quickly found scale with its FaceFighter franchise. Subsequent games were interesting but didn't have the same mass market appeal, at least until the company's first proper free-to-play release SpellCraft. It's certainly not perfect, but it is different to the typical Ville-style games, providing a deeper design mentality, as well as quality of presentation. This, combined with a push into Android and the company's previous game experience, leads us to expect good things in 2012. Previously known as Capybara Games, the Canadian developer stamped its mark on the App Store with Superbrothers: Sword & Sworcery EP - the most successful-innovative game of 2011. Yet it's been making brilliant mobile and portable games for years: from Critter Crunch to Might & Magic: Clash of Heroes. Surely, the time is right for it to hook up its undoubtable creativity and ubercool with a concept that ignites the mass market? The Canadian developer behind the successful Chop Chop series of iOS games took a breather in iOS. Raising investment, it decided to refocus around its key franchises, spending cash and time to build out a game in 2012 that would give it the best shot at finding a huge rather than a larger audience. With little access to information about how that approach is developing, it's difficult to judge the likelihood of success, but what's not in doubt is Gamerizon's proven ability with respect to arcade action games, or its ambition to develop games than can appeal - and be deployed - beyond a pure gaming audience. A Finnish start up, Grand Cru has excellent pedigree being set up by senior staff from Real Network's highly regarded Helsinki studio Mr Goodliving and from Sulake (of Habbo fame). Operating in stealth mode since mid 2011, it's been building the underlying technology it requires for its ambitious user generated sandbox debut; a graphically high-end as-yet unnamed game it describes with the term "We want people to enjoy playing it wrong." We expect more information from the company very soon. Given its Temple Run iOS game has been a phenomenon of the past 8 months, it may seem ridiculous to find husband and wife team Imangi Studios in the list of companies to watch for 2012. From games such as Harbor Master to Max Adventure, the duo have always provided players with a high level of presentation and gameplay quality. Yet, it's the scale of its current success - however surprising given Temple Run's slowness of uptake as a 99c game, swiftly changed as it became the freest of free-to-play titles - which provides the company with a significant opportunity to rise to the next level of the industry; a transition studios such as NimbleBit have made with impressive effect. Probably the worst named company of 2011, Swedish two-man team Mediocre burst onto the mobile gaming scene with its Android and iOS title Sprinkle. Heavily promoted by Nvidia for its Tegra 2 platform, it mixed up a simple-to-play water mechanic with great 2D graphics and physics, appealing to a large audience, both free and paid. We hope the duo will continue their upward cycle in 2012, even if it's a case of 'doing a Rovio' and maximising the potential of their previous game rather than building something new, exciting as that would be. Finnish developer Mountain Sheep burst onto smartphones with the Chillingo-published Minigore in 2009, but if company founder Jouni Mannonen can't be called a veteran of the scene, no one can. And that's something the company has built on, also developing the very successful Death Rally for Remedy, before going on to release Bike Baron (co-developed with French outfit Qwiboo) and Ice Rage. Surely 2012 will be the year that it makes the most of its experience and characteristic art style - at least if Mannonen isn't working and/or consulting on another company'sreleases. You won't know the name but you will know the games. Set up by ex-LucasArts staff, MunkyFun developed Villain's Archetype iOS FPS, before settling down to make the highly successful free-to-play MyHorse under the supervision of NaturalMotion. Where's next for the San Francisco-based studio, it's hard to tell, but we do know that if it doesn't decide to sell out, it's got the smarts to combine its high end 3D graphical talent with deep knowledge of online and freemium games that will make any move to its own original IP very interesting. Location-based gaming is a hot sector of the industry at the moment, but that's been the case (at varying temperatures) for a number of years. Not that there's been many companies who have made a dent in terms of building a solid and sustained audience for this type of gaming. But US developer PerBlue has. Its Parallel Kingdom game is available for iOS, Android and web/Facebook and has surpassed one million players. It's a particular impressive effort given the company's bootstrapped style. We look forward to how it will continue to support its audience, potentially launching new titles into the market too. Missing out on the main top 50 list by the narrowest of margins, Canadian Studio XMG is demonstrating fast growth and a willingness to experiment in terms of the games and entertainment it works on. It's released original IP such as Cows vs Aliens and Powder Monkeys, as well as a licences like Inspector Gadget. Another layer is provided by its transmedia strategy - see Totally Amp'd and Degrassi. Meanwhile, it's also worked on augmented reality games for physical toys and is tight with Sony; developing an AR game for the next Ghostbusters movie.